About five years ago, Ferrari embarked on a new program called their “special projects division” where they build exclusive cars for wealthy clients. I guess everyone wants to feel special. And buying a “normal” Ferrari isn’t special enough. And I guess they didn’t want Jim Glickenhaus to have all the fun rebodying their cars. The Ferrari 599 GTB Fiorano was Ferrari’s front-engined V-12 grand tourer that they built between 2007 and 2012. There were a couple of factory hot-rodded versions, namely the 599 GTO, 599XX, the HGTE (which was more of an options package), and the SA Aperta. The SP30 is a one-off model built exclusively for a wealthy Indian oil baron. It’s based on the 599 GTO and has revised bodywork. 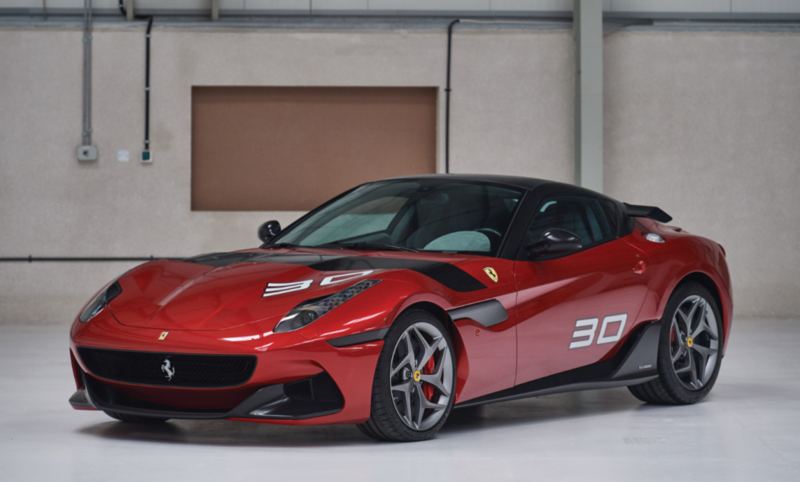 There is no information in the catalog listing, but because it is based on the 599 GTO, I guess we are to assume it is powered by a 661 horsepower, 6.0-liter V12. These one-off Ferraris are likely to continue to increase in value. And this one will not come cheap. Click here for more info and here for more from this sale. 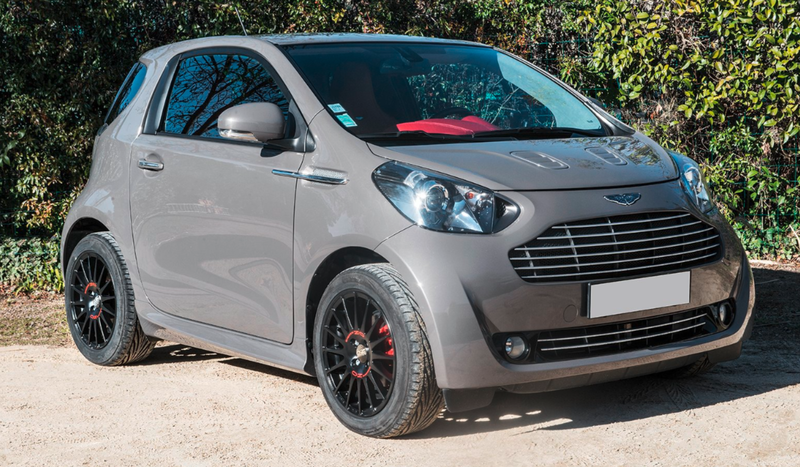 As a fan of obscure cars from big manufacturers (even those from Aston Martin), this 2011 Aston Martin Cygnet really hits the spot. The car is essentially a fancy version of the Toyota/Scion iQ city car sold all over the world. It got the Aston grille and a nicer interior. If they haven’t already, people will completely cease to remember this car ever existed in another five years. Probably because it was still a Toyota underneath. No silky-smooth V-12 power plant here. The engine is a puny 97 horsepower 1.3-liter straight-four. So with that in mind, the question you’re probably asking is “Why?” Well Aston Martin decided they needed to meet the 2012 European Union fleet emissions regulations and by offering a car that got 60 mpg they could continue to build other insanely powerful road cars. It’s easy to question their strategy of re-branding a Toyota now (well, it was then too) but, as you might expect, it failed spectacularly. They planned to sell about 4,000 of these a year at a price of about $45,000. Initially they were only sold in the U.K. and at one point Aston dealers in the U.K. were giving them away if you bought a DBS, DB9, or V8 Vantage (according to the auction catalog). Over two years of production, they managed to sell just 143 of these in the U.K. (there may have been another 150-ish sold elsewhere but I can’t verify that). Having covered 34,000km, this car is still expected to bring $48,000-$62,5000, proving even un-sellable cars appreciate if they have the right badge. Click here for more info and here for the rest of this auction’s lineup. “GTO” are letters used sparingly by Ferrari. Gran Turismo Omologato is a term reserved for very special Ferraris – special enough that it has only applied to three cars in their history: the legendary 250 GTO, the 288 GTO (arguably the company’s first supercar), and this, the 2010-2012 599 GTO. This model started life as the 599 GTB Fiorano in 2007. The company introduced a track day model in 2009 called the 599XX. It’s mission was to be extreme: and it was successful, becoming the fastest production car-based automobile to ever lap the Nordschleife. So Ferrari decided to build a road-going version of the 599XX. And this is that car. The 6.0-liter V-12 makes 670 horsepower. When it was introduced, it was the fastest-ever Ferrari road car (around the company’s test track), hitting 60 mph in 3.3 seconds and topping out at 208 mph. Only the LaFerrari is quicker today. 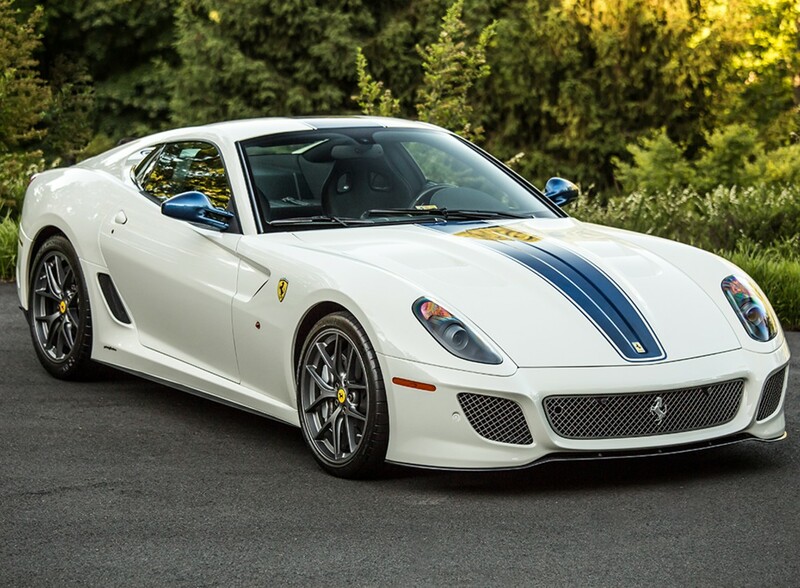 Ferrari limited production to 599 examples, with just 125 coming stateside. This 2,700 mile example should bring between $650,000-$750,000. Click here for more info and here for more from Auctions America. 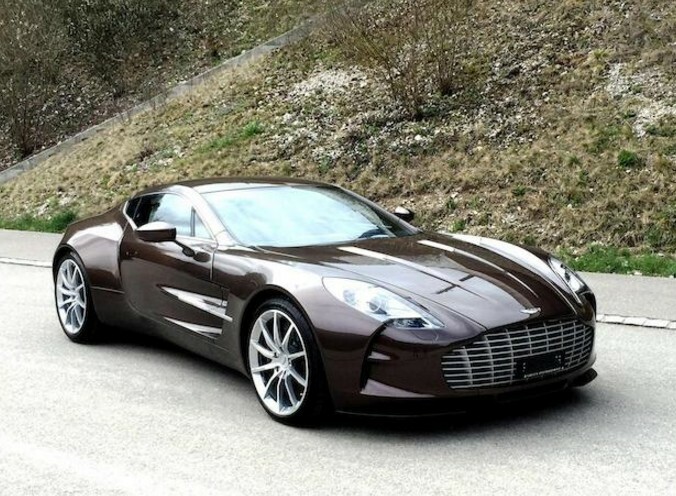 The Aston Martin One-77 is the most extreme road car the company has ever built – and one of the rarest: as its name implies, it is one of just 77 built. It was introduced in 2008 and went on sale the next year. All cars were complete by the end of 2012. Every car is unique, but all are powered by the same 750 horsepower 7.3-liter V-12 – making it the most powerful naturally-aspirated car when it was introduced. Top speed is a ridiculous 220 mph. The company never even officially let journalists drive it. This is car #25 and it was delivered new to Switzerland, where it has barely been used, having covered just about 850km since new. This is the first One-77, I believe, to hit the open auction market. With an original price tag of over $1.5 million, the car is now expected to bring between $2,000,000-$2,600,000. That’s quite the appreciation in just five years. Click here for more info and here for more from Bonhams in Monaco. 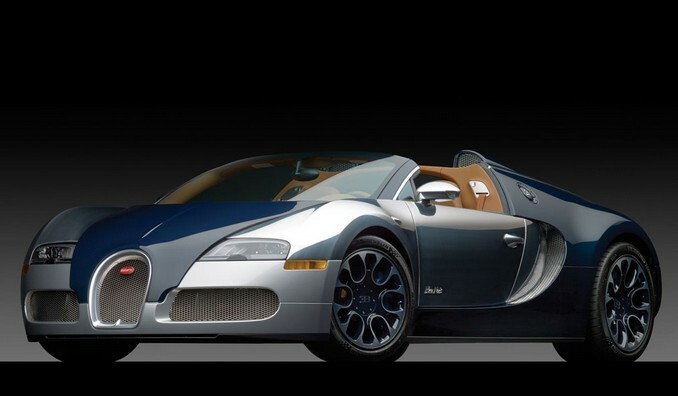 The Bugatti Veyron is the current king of special edition models. There are seemingly more one-off versions produced by Bugatti for various reasons than there are normal from-the-factory models. So here we have the Bleu Nuit. And it’s the only one like it. We’ll start with the fact that it is a Veyron 16.4: one of the most intensely engineered vehicles ever built. The engine is an 8.0-liter quad-turbocharged W-16 making 987 horsepower. And of course, everyone knows the original Veyron hit 253 mph. The Grand Sport (which is the roadster version) was introduced in 2009. It has a reinforced chassis to make up for the missing roof. There was a factory one-off in 2010 called the Sang Bleu and the owner to-be of the car offered here liked that car, but wanted some changes. So Volkswagen – err… Bugatti built him a one-off as well, called Bleu Nuit (“Blue Night”). It has dark blue carbon fiber and polished aluminium. It has covered less than 350 miles since delivery. Only 150 Grand Sport Veyrons were to be built (I think they may still be making them, but are capping it at 150). This is one of many one-of-a-kind Veyrons, but it’s the only one like this and it has a special from-the-factory designation. It could be yours for between $2,000,000-$2,800,000. Click here for more info and here for more from RM.